My tiny experience with bookmarklets in old Opera times never carried over to later times. They may be very useful, but it so happens that I don't need them. Anyway, I have noticed that when you start a thread on the Vivaldi forum about a feature or behaviour you want, sometimes things happen. And that should be a thread, not a feature request in the feature request section. The feature request section works by upvoting only, whereas in a normal forum post you can explain your issue fully, stress on the internal consistency of Vivaldi or how good old Opera used to be, and the developers just might pick it up. For example, I think that this is how/why the extra addressbar appeared in Vivaldi's hidden UI mode (use "focus addressbar" keybinds when the UI is toggled off) after I complained that it's not there, while it was a big thing in old Opera, and it is implemented in Palemoon and Seamonkey (yup, Palemoon and Seamonkey are usable with addressbar switched off). On the plus side, it taught me something about Chrome: Ctrl+Shift+Del is not exclusive to Vivaldi, but Vivaldi makes it easily discoverable through the menus. A big thing Vivaldi does better than Chrome is that you can actually press Escape to lose focus the addressbar. Freaking annoying in Chrome and Firefox when you get down to it. I have thoroughly stayed away from Chrome, so I cannot compare. Chromium should be close enough to Chrome, but I use it to open just one work-related webpage, so I have not explored much of Chromium either to be able to compare much. One thing though: I use chrome://flags Overlay Scrollbars. In Vivaldi it operates nicely. In Chromium it looks glitchy (perhaps a thing with the single website I use) and I keep it at default (disabled) in Chromium. Comparing Vivaldi to Otter, well, for example it's sad that Alt key does not do anything in Otter. When I have the menubar disabled and the Otter menubutton is there (or there's the minimalInterface), Alt would be the natural keyboard shortcut to get to that menu. This particular detail works in Vivaldi nicely again. It's a bit of a toss-up between userscripts and bookmarklets. Bookmarklets are a like on-demand userscripts. Also it's much harder to write/adapt userscripts to react to dynamic page changes, whereas bookmarklets you just execute when you want. That way they can be lighter and they don't slow down page loads either. Anyway, in my case there are aspects of my job that are horror without my table sorting bookmarklet. I've also been thinking about converting my Shift+click checkbox userscript into a bookmarklet, possibly all in one with the table sorter so it doesn't slow down every page load. It could be beautiful: F2, one or two characters, Enter. Much more elegant than going all the way through the bookmarks menu in Chrome. But unlike in Chrome, where bookmarklets work, Vivaldi just puts the code in the addressbar without actually doing anything with it... very confusing and weird. I'm actually dismayed to have found an aspect in which Vivaldi seems to be worse than Chrome. I mentioned that Vivaldi seems to be faster. I wondered if maybe it's because you need a few extensions to get certain basic functionalities in Chrome where even Firefox doesn't need extensions, but even without extensions Chrome still responds more slowly. I think it's pretty odd. Hm, today bookmarklets seemed to work. Maybe there was something odd about 'em having just been imported from Chrome or something. Btw, something pretty annoying is that Vivaldi doesn't show you the URL yet if something takes a while to get started loading. It's actually something I reported back in Opera/Presto that I think they fixed. It's been that long already. They added display tab cycler as list to the tab cycler. Neat! I hope for their sake that they use Firefox or SeaMonkey then. In no way that was expressed at the article. Like someone would say, Fake News. There's a bunch of comments there about Vivaldi being a Chrome clone with a few added bits and pieces. Which isn't completely inaccurate I suppose, but those added bits & pieces make Vivaldi a lot nicer to use. From something as simple as accidentally pressing the add bookmark shortcut (Ctrl+D) followed by Esc, the intuitive way to cancel an unintentional action. In Chrome that results in an added bookmark because you just dismissed your chance to delete it! Add quick commands, nicknames without having to abuse the search engine system, the ability to select multiple tabs, etc. and, well, you've got something a lot closer to what I expected when Opera announced they were switching to WebKit/Blink. ...you've got something a lot closer to what I expected when Opera announced they were switching to WebKit/Blink. Opera announced something impossible at the time: The changes would be under the hood and barely noticeable for the average user. Of course they could not keep the promise. It was not even a user-oriented promise, but a move to make monetisation of their product easier. 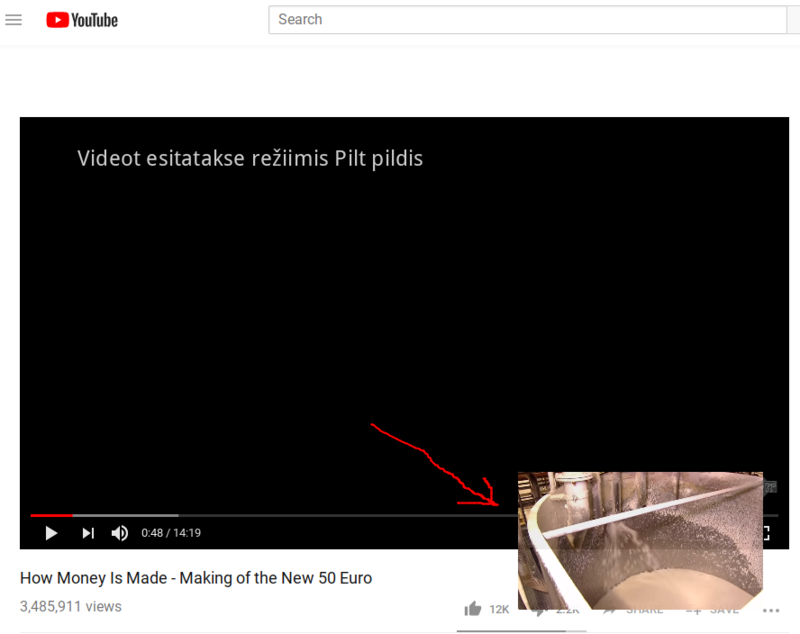 Vivaldi copied the highly questionable video popout from Chropera. Vivaldi calls it "picture-in-picture" for some reason and frames it as if an upcoming web standard. In the future, websites will likely use the Picture-in-Picture Specification to offer this via custom buttons and better control the experience for the user. Why is that likely? And what's the benefit? When I select the right-click menu item (requires frantic multiple attempts on YT because YT hijacks the context menu), then that which pops out looks like the same floating thingie that occasionally appears in the YT app on Android. The popout thingie is acceptable on Android, but it does not belong to the desktop. The correct thing for a browser to do would be to permit multiple distinct windows configurable as far as the browser is configurable. Yes, I can resize the popout, but is it a window of its own on my desktop? I have configured my window manager so that the window in focus is surrounded by big fat coloured border. This border does not get applied to the popout, so what is it? Is it still an in-the-browser thing even if detachable? When I make a screenshot of focused window, the popout is as if a single focused window, and it insists on appearing on every workspace on the same screen. And I cannot resize it with keybinds, so the window manager evidently does not have full control over the popout. What is going on? And why do this only with video? Why not do true detach with anything and everything? And why picture-in-picture? Is video the same as picture? Will the feature be extended to pictures later? I don't need answers to these questions. The fact that these questions arise show that the idea is wrong. I strongly prefer it the way Otter does it: the in-video full-screen function fills the browser viewport and then I can do with the browser window whatever I want - and I know how to do it because it is an ordinary window. I don't need answers to these questions. I think that Norwegian (and all Scandinavian) people do weird things. But I like their Browser and it suits my ordinary internet routine, so I use it. It's not even comparable with Opera 12. * but such is life, specially modern life. The source from the below table is Wikipedia. There's a browser called Coc Coc?? Fantastic. And I wonder how Safari still exists. Does not compute. Edit: Ah, probably some other planet where iPhone users exist is included in the statistics. I tend to forget the Apple planet. I know there's all kinds of Microsoft on Android, but there's a Microsoft browser on Android? Ah, probably some other planet where iPhone users exist is included in the statistics. I tend to forget the Apple planet. It could also partially be other browsers. Like Otter. Yes, surely mostly Otter. Possibly as an attempt to compensate for losing Windows Mobile OS. I like the way Edge on Android switches tabs. Easy tab-switching by touch is everything on handheld devices. Different spoofsters might identify this as Chrome, Safari, or anything as they please, I think. I know there are fans of Windows Phone, but frankly using a decade-old Windows Mobile device last year was an amazing experience. But I'll give Windows Phone that the utterly ridiculous Windows 8/10 "Metro"/"Modern" interface actually kind of works on capacitive touch phones. I suppose it feels a bit like the rough idea behind Android done right -- I just happen to like the idea of Windows Mobile better. But I'll give Windows Phone that the utterly ridiculous Windows 8/10 "Metro"/"Modern" interface actually kind of works on capacitive touch phones. Yes, the tiles are very nicely touchable. However, such tiles are not unheard of or impossible on Android either. On Android, I switch away all animations as far as possible (Google unfortunately seems to increasingly hardwire animations into the interface). On my earlier Android (Kitkat or Gingerbread or whatever it was called), I also installed some different homescreen app that created more tiles and vertical scrolls, instead of coverflows and page swipes. On my current Android (v. 6 on Note 4) I tried a few other homescreen apps too for a while, but Samsung's default is very sensible. Samsung even implements a dual-pane view to have two apps side by side that works very smoothly and floating windows to have even more apps running simultaneously. On Google Play you can get poor imitations of that. Did Windows Mobile have multi-app functions like dual-pane and floating windows? And Samsung Dex actually deserves an honourable mention of trying to implement something like a desktop on Android. It is perhaps not quite as desktop-y as Chromebook's opsys, but still it shows how Android's homescreen can be stretched to different dimensions. It's just that they would need to stretch it all the way and implement a tiling window management rather than floating. Well, both tiling and floating. And enable all imaginable scaling/resizing on every app and every imaginable resolution for the desktop. They already have the dock where you can plug in the keyboard, mouse, external harddrive, while it powers the phone. Put more ports onto that dock! Sure, of course you could do that, although that's not a thing that'd be very useful 99% of the time. At least on screen sizes from a decade ago. My phone has a larger screen than my old '09 GPS, which had something like 800x480 at 4.5". My Zenfone 2 has 1980x1080 @ 5.5". Windows Mobile gave you the power of Outlook. Android gives you a simulacrum of Outlook. There's a browser called Coc Coc?? 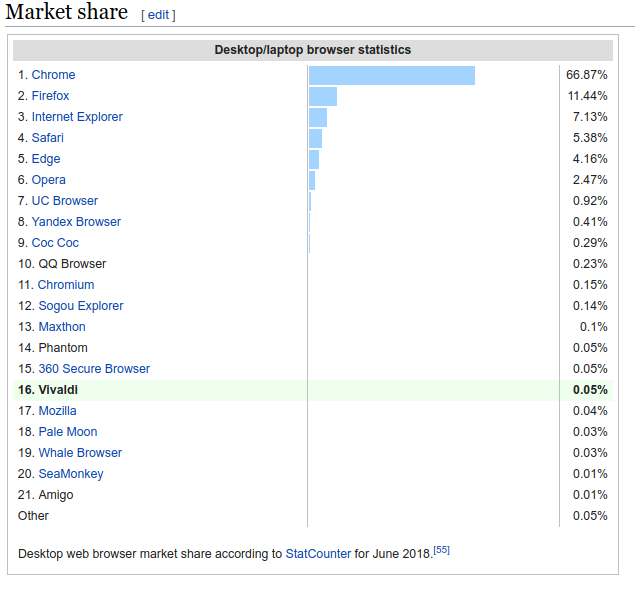 Sorry to quote myself but I got curious about this Coc Coc browser at the ninth place of most used browsers. This browser is a whole new experience "tailored" specifically to the everyday needs of Vietnamese people. ... do Vietnamese Still Plant Rice? ... do Androids Dream of Electric Sheep? Perhaps the browser statistics firm is headquartered in Vietnam. About Vivaldi, by many reasons it turned the browser I use in Ubuntu. And I've experienced many many things. The one primary reason I like Vivaldi is the interface toggle. There are also other good features reminiscent of Opera, like Quick Commands and secondary address field. Then there are also features that are utterly inappropriate on desktop, such as Picture-in-Picture/video popout. A secondary reason to have Vivaldi is that it has the Chrome rendering engine (an unfortunate necessity on the web, just like IE used to be around the turn of the century) while it is not Chrome. In one blog post, Vivaldi CEO admitted he gave a finger to evil Google and got screwed. We made effort to understand [Google's waffle about suspending Vivaldi's AdWords account] and to work with them on their various unreasonable demands (some of which they don't follow themselves, by the way). After almost three months of back-and-forth, the suspension to our account has been lifted, but only when we bent to their requirements. A monopoly both in search and advertising, Google, unfortunately, shows that they are not able to resist the misuse of power. I am saddened by this makeover of a geeky, positive company into the bully they are in 2017. He should have known better: When you know it's evil, do not give an inch. When the demands are unreasonable and they don't even follow them themselves, thou shalt not bend. Vivaldi, yet another Chrome fork presented in a new shell as a facelift and enhanced with a few built-in extensions. And no it's not only the layout and the ECMAScript engine taken from Chrome but the whole construction like networking etc. Privacy wise it offers even less user control than Chrome. It's funny/sad to see how many of those people complaining about Google's monopoly and evilness are using their browser/forks helping Google to become even more powerful and hoggish. How about a specific example so we can compare and make an informed choice. Not helping, but simply trying to survive and get things done. If it were possible to live without Google's rendering engine, I would, just like I abandoned Microsoft Windows as soon as it became possible. Our Spatial Navigation feature is disabled in this build: It will return in the future. It really does not invite me to update when you turn off one of your most notable distinguishing features. Page created in 0.055 seconds with 40 queries.